Wandering Albatross (Diomedea exulans) in flight, East of the Tasman Peninsula, Tasmania, Australia. Credit: Wikipedia. 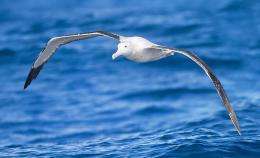 Albatrosses leverage the energy of the wind to fly with essentially no mechanical cost to themselves, very rarely flapping their wings, and new work published Sep. 5 in the open access journal PLOS ONE offers insight into how exactly they accomplish this feat. The researchers, led by Gottfried Sachs of the Technische Universitaet Muenchen and Francesco Bonadonna of the French National Centre for Scientific Research (CNRS), used advanced GPS tracking to determine that the energy gain during the albatross's "dynamic soaring" comes from a repeated oscillation consisting of a combined curve-altitude flight maneuver, with optimal adjustment for the wind. The results may provide inspiration for robotic aircraft that utilize the flight technique of albatrosses for engineless propulsion, the authors write.